There’s been a lot of discussion, this year and in years past, about how the WHL seeds its teams for the playoffs. This year the debate was especially vigorous as the 6 East Division teams all had higher point totals than the #2 team in the Central Division. But because of the format, Saskatoon didn’t make the playoffs while Lethbridge and Red Deer did. So let’s examine the current format and some other possibilities that you may consider more equitable. (You can click each bracket for a larger version.) We may not be able to solve the problem today but at least we can have some more information. Next, a modified version of the current format. In this version, the remaining teams are re-seeded after round 1 based on regular season point totals. This is what we call a soft bracket. Now we have some formats using division standings. The first one takes the top 4 teams in each division and seeds them by point total. This is a hard bracket. This is the same format as #1 except that the teams are then re-seeded based on point totals. A soft bracket. This format still takes the top-4 teams in each division except if the 5th place of one division has more points than the 4th place team of the other division. This team would crossover and take the position of the 4th place team, regardless of the number of points. A hard bracket. Same as #3 with the teams re-seeded after the first round based on point totals. A soft bracket. Now we move on to some Conference formats. The first one gives the top 2 seeds to the division winners then seeds the rest by point totals. A hard bracket. This bracket gives the top 2 seeds to the division winners but re-seeds after the first round based on point totals. A soft bracket. Finally, this conference format does not reward the division winner with a top-2 seed. All 8 teams are ranked by point total. A hard bracket. Here’s what a league-wide format would look like. This first one seeds the division winners 1-4 based on point totals and then seeds 5-16 by point totals, as well. A hard bracket. This is the same format as #1 but the teams are re-seeded after round 1 by point total. A soft bracket. Last but not least, a hard 1-16 bracket. So now that you have seen all these possibilities, which one do you think is the best fit for the league? In my opinion, the bracket you have labeled “conference format #1” makes the most sense. I believe that is the way the playoffs were seeded, up until a few years ago. I would go one step further and suggest a hybrid of conference formats 1 and 2. It would be a “soft” bracket, but would be reseeded by lowest remaining seed plays the highest remaining seed regardless of point totals (so that both division winners would still be guaranteed home ice for the first two rounds). So, if #8 upsets #1 in the first round, they would likely play the other division winner (#2 seed) in round 2 (assuming that #2 wasn’t also upset by #7), instead of playing the winner of #4 vs. #5. 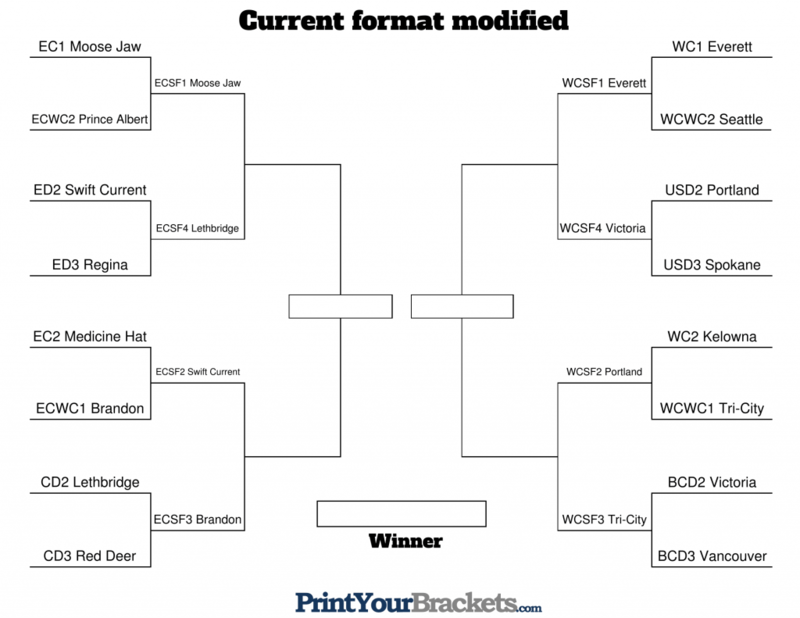 The current format probably saves the league some money in travel expenses, but it is silly. We now have the two best teams in the Western Conference (Everett and Portland) playing against each other in round 2. Whoever wins that series will have home ice and be a heavy favorite to beat the winner of Victoria vs. Tri-Cities in the conference finals, which almost makes the round 2 matchup the de facto conference championship. Using conference format 1, we would likely have Tri-Cities vs. Portland (assuming that the Winterhawks would have beaten Vancouver, which seems likely), and Everett vs. Spokane/Victoria. 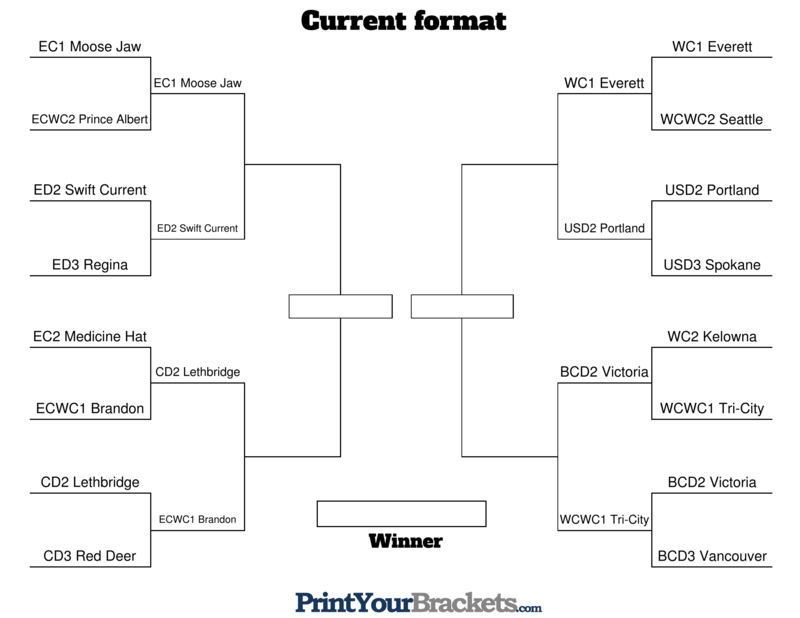 Using conference format 2 or my suggested hybrid, Tri-Cities (being the lowest remaining seed at #7) would have to go play Everett, while Portland or Vancouver would play Victoria/Spokane. It also seems a little unfair to Portland to have to go play Everett next, with Everett having home ice. Whichever team is eliminated will go home for the summer, while an inferior team (Victoria or Tri-Cities) plays for the conference title.